Building Stonehenge Neanderthal origins? A stone age find by the Author. still being tested but are thought to be of a similar age. Neanderthals, their now extinct hominid cousins. whom doubt there was much mixing of the species. was fully human and capable of reproduction with any other race of humans. This guy Stephen Wells--check him out. We can do something like this also. wonderful new source of data just ripe for the taking. as other studies have shown that later Europeans decended from Neanderthals. Teno. Teno probably figured out what happened, hence his response. Sure there probably was some migration prior to Babel. I think it is possible that the Japethites may have already been exploring and settling some of the coastal areas since there would have been a need for supply of minerals & raw materials, furs, ivory, preciious stones, spices, etc. We can only speculate. Also you can look at Craig Whites work and see that there seems to be an absense of decendants of Japeph in the region of the Fertile Cresent. I do not derive this from chap. 9 & 10 but from Craig's work, and common sense. You need to show exactly why you believe that the passages indicate an early migration. Nimrod would have needed a trade network to supply his empire and the sea is the best means for moving trade goods from more distant regions. There is some evidence that a Sumerian presence reached clear to South America--possibly ancient Ophir and gold prospectin--who can know. Brasil/ Brazil is a name associated with iron and it was known from very early times. from my brother's email address. what Bill has done and do a whole lot of research and be able to docthat you have done the research. I am still trying to figure out what you are seeing in Gen. 9 &10.
why). I do not know how he backs this up. 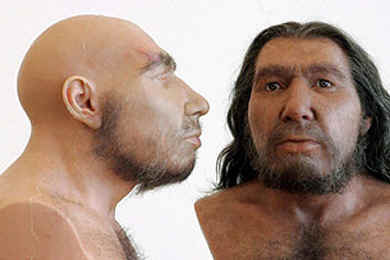 Has he analyzed Neanderthal DNA? every report. You could check this out. huge, rugged, very tall, with massive skulls, very roundbroad heads. They were physically different than the long-narrow headed native "Archaic"
peoples. The big, roundheaded newcomers brought D-shaped 11-inch celts. river at Quebec- New York-Ontario. upper New York to West Virginia and the Ohio River. phase (2,000 to 1,000 BC) of the "Middle Great Lakes-St. Lawrence Culture"
History Native Peoples of Canada: 10,000 to 1000 BC). Maritime or Laurentian Archaic, who had elaborate burials for kids. Christian era. Click and drag photo to resize. Irish tradition recounts that the brutal, warlike Fomorians were "giants"
who invaded in ships from Africa, and demanded children at Halloween time. Pict tradition held the same. endowed with double-rows of teeth. skulls and double rows of teeth. the Tennessee Valley have been excavated, confirming Native traditions. different possibilities for the creation date. We have a lot of work to do. important part is that you use good hermeneutics in interpreting the Bible. dates. Many historical calendars were based on these dates. virtually all of the 1500-year difference between 5500 BC and 4000 BC. daylight period) in the proleptic Julian calendar. Creation, and hence the exact time of Creation, at the previous nightfall. are considered human by mainstream scientists. be for the "deep mist" of time before 1500 BC. freely without having to draw contentious conclusions. giants in the traditions of ancient people worldwide. that sent populations to the four corners of the Earth?
" in Scandinavia 62 after Babel or am 1824 and 2180 BC don't worry about it. infact ownly 696 years. Maybe this is a strange coincidence one might say. from Tenno Groppi. Once again Sir :- Many thanks for your time John. No one is able to keep up with the torrent of new knowledge. But is man the wiser for all this new knowledge? generation that has ever lived. But it is not! And there is a reason. is an age typified by a chaos of ideas. called chaos" ("Biblical History in Transition"). intellectual curiosity to see whether the hypothesis be so! Scripture is labeled "unscientific" and "myth"? another hypothesis will not resolve the problems. science and history find answers. organize themselves into clear and unmistakable answers. two choices are available -- hypothesis or Divine Revelation. archaeology, or human history contradict the Bible. satisfactory -- and satisfying -- explanation of Man and the Universe. of history and the Bible. Scientific and historical journals are filled with "learned"
factual material. There are often "too many" facts. time, and the record of his experiences. Why don't today's educators know the answers to these problems? key is God's revelation of essential knowledge for man -- the Bible. therefore refuse even to test whether the Bible is authoritative. Where in geologic strata, does Creation Week of Genesis 1 occur? What happened to the earth as a result of the sin of Cain? What is the relationship between pre-Flood Man and fossil Man? the geologic period labeled "Pleistocene" by scientists? Is this the Biblical Flood? the Bible, and not evolution! accompany a geologist on one of his field trips. explain to the geologist the apparent age of the fossils. paleontologist discover how old fossils are? Simple! He turns to the evolution theory! earth today. "But what is the age of the fossils?" asks the geologist. order in which various species of life evolved." And that, in simple language, is what happens! age of the strata from the assumed age of the fossils. assumed age of the fossils, "younger strata" are below "older strata"
occurred which placed them in the wrong order." strata were laid down exactly as I found them." That is THE WAY evolutionary science is practiced. down all the twiggy side arguments fall with it! no evolution from one Genesis kind to another! Naturally, geologists have found many important and true facts. history becomes plain. Now take a look at the facts as they are found. See how they fit the Bible account. studies. They tell an incredible story. they know no bounds to their wildest speculations. if an answer were there. plants having their seeds enclosed in an ovary. this was a "proof" of evolution. They couldn't have been more mistaken. and flowering trees. Why the sudden appearance of new kinds of life? all to see. There has been no past evolution of living matter. The first chapter of Genesis contains two distinct accounts. Genesis 1:2 -- meaning "not a waste"), he formed it to be inhabited." The first or pre-Adamic creation was turned into a chaotic wreck. earth was covered with water. below the break are the remains of the pre-Adamic world! geologists could hardly believe their eyes. An immense catastrophe had befallen the earth. upheaval geologists assign the label "Cretaceous" -- meaning "chalky"
because there is none there to find" ("The Deep and the Past", p. 266). has been buried under tremendous volcanic eruptions. Read that astounding quote again! before Adam and the world since the creation of man. accepting the truth of Genesis 1:2.
toward the north and east -- the other southward. evidence. On page 35 of E. A. Speiser's "At the Dawn of Civilization"
is a geologic map of Palestine in the so-called "Upper Cretaceous." Valley and Dead Sea were not then formed. deposits in their Biblical background. scientists as millions of years old. Time, to them, means nothing. evolutionary hypothesis to be a fact! wanderer) and a vagabond shalt thou be in the earth" (Gen. 4:11-12). utter depletion. Mountain chains arose where there were none before. recorded in geology and archaeology. building. Pluvial and arid periods fluctuated. labeled Canada and Europe on our maps. The Arctic zone expanded. today. Geologists mislabel this pre-Flood period "Ice Ages." Paleolithic." Their culture exactly fits the curse that befell Cain. important discovery (see her book Digging Up Jericho). family of Cain settling among the family of Seth in the Middle East. Numerous fossil skeletons attest to this fact mentioned in Gen. 6:1-2.
pottery Neolithic and related cultures. stages of the pre-Flood world (see Genesis 4:22). fifth. Radio-carbon dates that are earlier than the 4300's ± 300 B.C. labeled by archeologists as a transitional "Neolithic-Chalcolithic"
society developed into a so-called "Early Chaleolithic" period. found by archaeologists ("Palestine before the Hebrews", p. 241). Abraham's descendants ever since have been famous breeders of horses. identification and placed the Ghassulian culture 1500 years too early! generation after the flood. I don't know which race they were. >un the numbers that tightly myself. traced historically to a young age. http://www.dinosaursinthebible.com please forward this addrfriends and family. for more information on creation vs evolution. I've been behind on answering email lately, and am sorry for the delay. An older Earth dating for Neanderthals? DNA, is being carried out at the Leipzig-based institute. a spokeswoman for the institute. in Berkeley, Calif. is also participating in the project. would amount to more than just a spectacular display of science. scientists hope it will help reveal the molecular evolution of human beings. JXF and DJ - Neanderthals and the "Deep mists of Time"
Britain which gives credence to my industry table for Britain and Ireland. can send him one of my tables. Looks like the hunt is finally under way. >comment on who they were. >Yes, you have made a good point about Charles Kimball and White and others. >not support millions of years of humans living in caves. >further than for what the bible will allow for creation namely 6000 years. >Britain. I am of oppinion that the formores were the "Natives of Britain"
I got 2 copies of your long list and many of the SOS. I am in the process of rewriting a paper on Chronology and since I am quite focus, I will probably not even look at my email for days (as I just did). Recently, google has digitized many of the books from 1780's to 1890's which have a lot of Christian materials on ancient history with references to orignial sources - Checking these is taking almost all my time right now. Thanks Dan for yours recent reference. I have made some incredible breakthroughs recently on the History of the World. As I have said before, my interest is in doing historical research from the most origninal sources I can find. This Neanderthal looks like it might make some interesting connections between ethnic characteristics we find in graves and the people groups that dispersed at Babel. Non-the-less, it is not my primary interest at this time, nor would I be a good judge. Note: Custance is not original, but fortunately I read him to find his deductions and then try to find his sources. If you are asking my to review information which will help you make a tighter case for your models, then I really need you to do most of the research and to organize it in a way that I can make sense out of it easily without taking hours to reorganize it. I am impressed that you found quite a few sources. I would ask you to organize it in the following way with one piece of information on a line with reference on the next lines. <Web Link or Reference 2> etc. If they found 8 Neanderthals in one grave yard, then we still have 8 lines unless they are all dated to the same time frame. As creationist we will have quite a time finding a good method for translating evolutionary date to their correct time frames. Evolutionist seem to use different dating methods depending on when they think the site should be dated. For example, Scara Brae, (village on the other island to the East), and Windmill Hill all seem to be dated at about 3,200 BC (Evol. adjusted) However, Ciocal Gricenchos (about 2200 BC) is the dominate leader of that early date. It would be reasonable to speculate that he founded the villages in northern Scotland. But they could have been founded by the next wave. So just as we have 3200 BC in Egypt translating into 2150 BC, we see the same above. Now consider the Ice Age model which places large glaciers over the baltic and north sea. Before the rapid Ice melt about 1500 BC, much of the north sea and baltic sea were just low land with the weight of the Ice ultimately depressing them. Then the rapid Ice melt cut deep channels which separted land masses. The English channel was cut, possibly even the channels between England and Ireland. Thus a trip to establish Windmill Hill was much more difficult than just sailing around the coasts. Did Ciocal Gricenchos do Windmill Hill also (maybe, but maybe a different survey team did so). It depends on the remains that you would find there. It will take a lot of data to say much for certain. But if we find ancient records that are credible, they will shed a lot more light on the subject. Any other factor to consider is that, at least in the middle east, intermarriage between the groups of Ham, Japeth, and Shem was wider spread early on the I expected. I still do not have the answer to my question if the remains at these early sites in northern Scotland are neanderthal or not. I've been looking but did not see an answer. Maybe the answer was obvious to you, but it was not to me. It was nice to see the number of Neanderthal in the Canaan area. That certains meets some objections. Once I mentioned to Dr. Carl Baugh that he had many wonderful speculations. This was a compilment from me. It appeared that he did not take it that way. To expand on my views on speculation. I think it is very important to speculate and look for a wide variety of possible hypothesis. In general, the more different ways we are able to look at things, the more likely we are (given sufficient data) to see the way that thing really fit together. Creative minds discover more things. That being said, we must always be clear that such a hypothesis is speculation or are there sufficient corrulations behind it too make it more solid, possibly even certain. The more facts that corrulate with the hypothesis the more likely it is a solid theory. In my field of Chronology, one can get enough supportive evidence to be certain of a date plus or minus a certain tolerance. For other dates, the range can be so wide for a certain event that any guess is mostly speculation off of one or two little fact. In a different field, so little information might be known, that any support suggests a strong hypothesis. One's use of the term speculation depends on one's field. In another place you suggested that Ciocal Gricenchos, by deductive reasoning, was probably the leader of all the people types in that area. The web sites I have viewed on him certainly suggest he was a powerful leader. That he lead all people type is certainly one reasonable approach. Yet it is just a reasonable to believe that the different families of man were distinct with different leaders. The giants which reach england probably were not under Ciocal Gricenchos authority. Historically, to the best of my knowledge, Ciocal Gricenchos was the first leader in the area which I suppose is Northern Scotland and Ireland. It appears he made stops on the coast of france and england. All other colonies, Asshur in Tier, and the Celts who moved overland through Germany to France would have made it to the area so much latter that I would doubt that they were responsible for any of the 3200 BC (evol) villages or monds. But one can't discount anything at this time. Some of my reading is now building a level of support for some early records that, if true, might shed some more light on your research. Hopefully in the next 6 months or so. Best get back to writing now - at least for 3 or 4 days until I burn out. John this may be a breakthrough on Neanderthal. I am curious why James has mentioned the Berbers and Tauregs. There seems to be a relationship between the Berbers language and the Celto-Iberians of Spain and the Phonecians. I do not know about the Tauregs but they seem to be of Hamitic stock as were the Phonecians. So are we to suppose that the Neanderthals migrated there by ship and were the early protoPhonecians? I am curious if this is possible or perhaps this is a very bad guess. I don't feel like I have done near enough research to venture a proper guess but the evidence seems to be pointing in that direction. Or perhaps the Neanderthals are from an early migration from North Africa and preceeded Phonecian influence but then why no Neanderthals in North Africa? Lets suppose we have a group of Canaanites that settle in Lebanon and then migrate by ship to North Africa, Spain, and to the British Isles. This would have occurred at the beginning or middle of the Ice Age. And that would explain the locations of the Neanderthals. Their decendants may have become the Formores, Picts and protoCelts. I found an interesting reference to the original inhabitants of the Canary Islands existing as a stone age culture and what some researchers thought were a parallel to the Neanderthals. Not sure what to make of that. > > theNeanderthals were longlived because of cloud cover during the ice age. > > which coincidently Darrell has informed me that they were responsible for. I have also been research this topic and coming to the conclusions expressed by Dan below. Atlas or Antaeus ruled North West Africa at the time of Osiris and Isis in Egypt. He revolted against Osiris (estimate 2067 BC) and was killed. Some web sites suggest that Cichol Grincenches came north from this group. Yet the web sites I have visit all claim that Poseidon (Sidon, first born son of Canaan Gen10:15, 18-"afterward were the families of the Canaanites spread abroad") was Atlas' father. If so, then Atlas was a Canaanite (family of Ham) which would explain (historically) why Nimrod (Osirius) would place him, Antaeus, as ruler of all West Africa while Osirius was on his expedition around the world. Speculation: If Atlas was a son of Sidon (born about 2280BC) then this region of north africa would have been from the earliest times a launching point for the "spread[ing] abroad" of Canaanites. A natural staging point for Cichol Grincenches. See how this fits with Dan's idea. Request: Do you have any evidence that Atlas was the son of Poseidon? If you come across any, please let me know. "a youth of the family of Nin son of Bel (whose name was Adhna son of Bioth) to spy Ireland about seven score years after the deluge." "Cíocal, son of Nel, son of Garbh, son of Ughmhóir, from Sliabh Ughmhóir"
[Nil in another translation] This is place much further into Keating narrative. Ciocal who was mature 200 years before Partholon could not have a long linage connected to no one we have heard of. 2235 BC is 200 years before. If he was 40 years old, then born 2275 BC. So I think Keating's source got the wrong geneology. "they (were) two hundred years (living) on fish and fowl till the coming of Partholón into Ireland,"
p.65 All Irish were Japhetan " Only the conquered aborigines of Ireland, the followers of Ciocal, had a distinct Noachic genealogy, being 'descended from the accursed Ham,and come out of Africa'." But neither of these are old sources. "They were demons, according to the chroniclers, and descendants of the luckless Ham." "Fomorians, a race of evil seafarers"
"The second name [for Ireland] was 'Crioch na bhfuineadhach from its being at the limit or end of the three divisions of the world which had then been discovered; 'fuin' indeed, from the Latin word 'finis,' being equivalent to 'end.'" Nemedius battled with Formorians -- "These Formorians came from Africa ..."
Sea people - fits Canaan the best, but others possible. giants - fits Canaan the best. from Africa - Sidon had colony at tip of North Africa - fits Canaan the best again. But we still do not know. Dan said Posideon had 10 sons and 10 kingdom. Speculation would suggest Ciohol might have been one of his sons and the Northern Kingdom his. I must say that this is getting rather exciting. This info. needs to go in a book at some point. It is exciting because we are now back into the very dawn of history and things are starting to make sense. http://www.skepticssa.org.au/html/atlantis.html This is the source for the 10 sons of Poseidon. By the way I really like this site's conclusions on Atlantis concerning its mythical nature. I tend to agree that it did not exist and that the Atlas mountains are the focal point of our historical investigation. Plato was making up much of the story. Notice how the timing is all off as well and promoting the egotistical view of an inflated date for historical Greeks. And notice it is the Athenians who defeated the Atlanteans. I think there was a general awareness of a huge land beyond the sea (a ring continent) and that somehow got mixed up in the story. Perhaps even some of the details of Atlantis came from knowledge of the Americas or a city in the Americas who really knows. The fact is that this is one story that has nothing substantial from other historical evidence to back it up so why should we pay much attention to the story of Atlantis. Rather we need to go to stories with multiple sources all pointing to the same facts. The Atlas mountains were in Northern Africa and there probably was an individual named Atlas who was a son of Sidon (Poseidon) and obviously some of the North American Indians descended from North Africans since America was known from early times by the Phoenicians and Carthaginians, Who knows, the Aztec reference to having come from Azlan may be a reference to having come from North Africa (Atlas mountain region). This makes more sense than hypothesizing that Atlantis is a now extinct continent in the middle of the Atlantic ocean. There is no evidence for that. So Plato may have had a few of his facts straight but obviously it is embellished to a high degree. Also at this site Darrell you will find support for your idea that the isthmus broke and the water overflowed from the Black Sea into the Mediterranean swamping islands in the Aegean, etc. Wouldn't this be more likely if the waters were inundating from the direction of the Black Sea? I think so. This is what the site says..."The explosion and the deluge, as the waters of the Mediterranean rushed in to fill this enormous chasm, caused enormous tsunamis that radiated out from the former island, swamping islands throughout the Mediterranean. The ensuing disaster when these waves hit islands such as Crete, then the center of the Minoan Empire, would have had an enormous impact on their economy. It seems very likely that most of their huge mercantile fleet would have been destroyed at this time, and what is known is that the Minoans’ power declined rapidly from that time and, within 50 years they disappeared from history." John you have a lot of work to do to get this together and get it properly organized on your web site. This site is wrong about Hyborgea because this is a well known reference to the new world according to the excellent work of Gunnar Thompson. The Picts were in existence at the time of the Romans. Since there were several invasions it would seem that the Pict lineage was not exclusively Formorian but perhaps a mix of the peoples who lost at each invasion (obviously they would have interbred and at times banded together to fight the invaders) (a mix of a Nemedius's descendants and the Formores). Two sources say different things about the Formores. Once source says they defeated Nemedius which seems to make more sense than Cooper's idea that they repulsed them even in low numbers after suffering a plague. That would explain why Nemedius' grandchildren started their colonies in Greece, Belgium, Scotland and then the first two came back after they consolidated their numbers and reconquered Ireland defeating the Formores. http://www.ccg.org/english/s/p294.html I think the Picts had some Hamitic ancestory (Neanderthals possibly) and also some Cro Magnon which may be the predecessors of the Celtic stock. This is the mystery. It is also possible that the Formores may have been wiped out but I doubt that. I think they integrated with Nemedius' decendants to become the Celts. Isaac Newton (as quoted by Larry P.) came to some very bad conclusions on Ancient History because he tried to use name matching as a primary technique to reconstruct History. Very bad stuff - none-sense. In fact many of his assumptions were based on bad information. If Larry P. holds to Newton Ancient History, then I assure you it is really off. Never-the-less, Newton used a technique of generations to try to correct some of the Greek History which his bad assumptions suggested was in error. This is a valid approach to a general spacing of generations. Using the Bible generations as a guide, from 1000 BC to Christ, one of his lineages averaged about 25 years per generation and the other about 35+ years per generation. Biblically, it seems that a generation was about 40 years from 2000 BC to 1000 BC. From Christ on, about 30 years per generation is very good. Nevertheless theses are just approximations. The list of generations from Nimrod to Sargon suggests about 38 years per generation. I have used 38 years per generation as a rule of thumb from 2300 BC to 1200 BC. Obviously it can be off quite a bit, but since we do not know better, it gives us a ball park to play in. Speculation is usefull as long as it is identified as speculation. Using 38 years per generation does not allow me to round off to the nearest 10 years and keep the generation spacing reasonable. Thus I used exact dates knowing they can be off by quite a bit in the hope that I will find more information that allows the date to be refined. Dan do you reckon the Neanderthals found in a cave in Israel match Dr Cuozzo's concepts of the Old Men of Genesis Ten as Proto Semite /Neanderthals? Question:- How do we work out the years in the Genealogies of Ham and Japeth from the flood when the scriptures are silent about this? John . Donalds ideas seem quite wrong. Neanderthals originally had sailing technology in all probability and then were decultured over time. They would not have had to have a land bridge as they probably migrated from Canaan to Spain by ship as there is a vast distance between that lacks Neanderthal remains. But we can not be certain of this. gene, which is associated with human speech. still believe there was little or no interbreeding. Detectives, mentions Neanderthal in England. version of the female picture in Science News. in Ireland for the descendants. Neanderthals or ancient Homo sapiens were capable of neolithic or more as my evidence shows. But the "ice-man" was no neanderthal. I have looked closely at his photos. He doesn't fit the neanderthal facial characters. I have never examined it in person. The Phoenicians were in Britain mining for tin and copper arroud 2252 BC untill the despersion in 2191 BC. Cichol Gricenchos was a son of Sidon which would make the Neanderthals have Caananite origens. Medai son of Japeth saw his land Britain (The Ilses of the Sea covered in Ice arround 2247 but did'nt want it so traded it with land in the Middle East. King Eric of Denmark came with his Neolithic coloney in 2129 BC 62 after the despersion from Babel. Thus we would also expect to find artifacts from this coloney also from the North Sea. >> "Dogger Lands" Don,t we. > order to make an educated guess.